Honor has confirmed 5000mAh battery on its upcoming Note 10 smartphone which is scheduled to go official on 31st of July. 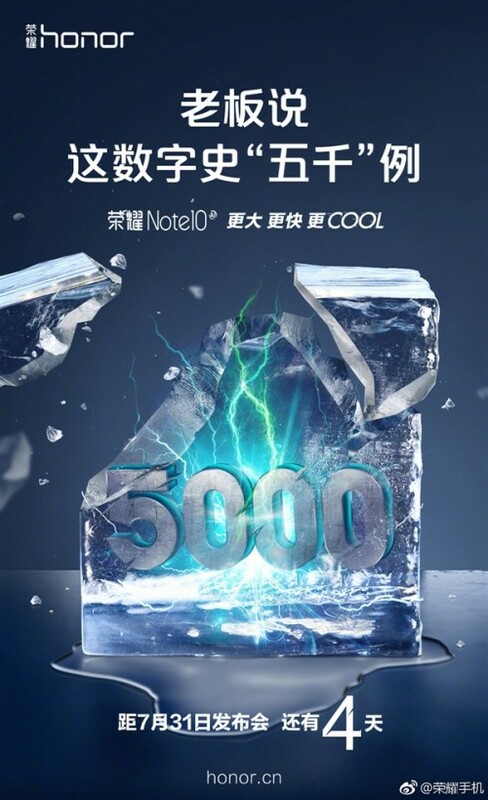 A teaser was posted on the companies Weibo page which also mentions COOL tech that will be featured on the smartphone. This indicates that the handset can be coming with some cooling technology to cool the smartphone which intern indication that the handset could be a gaming device. From the earlier leaks we know that the smartphone will come with 6.95-inch Super AMOLED 1080 x 220 pixel resolution display. There will be a Kirin 979 chipset under the hood coupled with 6GB / 8GB of RAM. The camera set up on the rear will be 16MP + 24MP while on the front it will feature 13MP sensor for selfies. Now it has also been mention that there will be a massive 5000mAH battery. Earlier: Honor, which is the sub-brand of Huawei confirmed last week that a new Note series smartphone will be launched which will be the successor of the Honor Note 8. 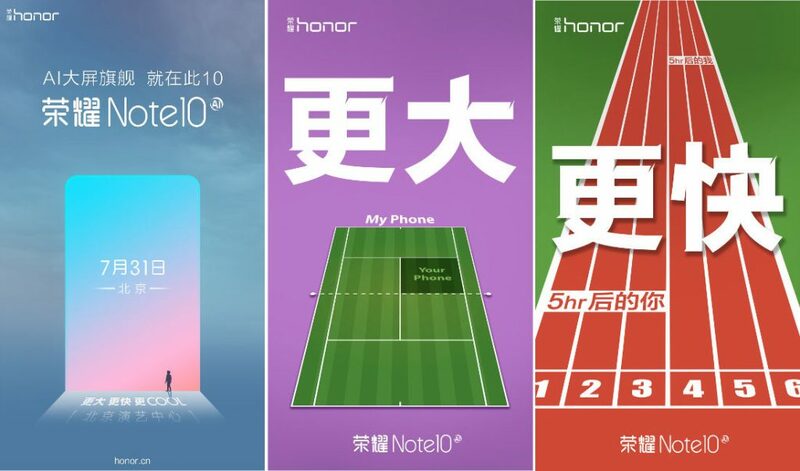 Now a device called as Honor Note 10 has been certified by TENNA with the model number RVL-AL09 which also confirms the existence of the device along with the complete specs sheet. The handset is expected to be coming in Blue and Black color variants and nothing about the pricing is known yet, which should be known when the device goes official the coming week. According to the listing, the Honor Note 10 will sport a 6.95-inch (1080 × 2220 pixels) FHD+ AMOLED display with 18.5:9 aspect ratio and 2.5D curved glass. It will come out of the box with Android 8.1 Oreo operating system with the companies own EMUI 8.2 on top. This will support Dual Hybrid SIM slot wherein the second slot can be used for either a nano-SIM card or microSD card. The storage options include either 6GB or 8GB RAM memory and 64GB, 128GB, and 512GB internal storage options, which can be extended further up to 256GB via microSD card slot. Under the hood, we can find an Octa-Core Huawei Kirin 970 (4 x 2.4 GHz A73+ 4 x 1.8 GHz A53) 10nm processor, coupled with Mali-G72 MP12 GPU. There is a 16MP rear-facing camera with LED flash along with features like PDAF, CAF, and f/1.8 aperture size, while there is also a 24MP secondary camera with f/2.8 aperture. On the front we can find a 13MP selfie camera and to enhance the security levels, we can also find a fingerprint sensor. To power the Honor Note 10, there is a 4900mAh battery with fast charging technology and has other connectivity options that are required for automation of the device. We need to wait a few more days for the device to get official and comment in the section below if have any queries on the same. Stay tuned to Android Advices for more news and updates.